About 10% of the population in the world has some form of mental disability, and 1% has severe form of mental disorders with disability. The recent development in mental health services in India is the community care approach. The epidemiological surveys in India showed the prevalence of psychiatric disorder varying from 9.5 to 370/1000 population. However, recent census data reported that 2.21% of the population has some form of disability and among them, only 2.7% has mental illness, and 5.6% has mental retardation. This may be because the data collected could not detect mild or moderate degrees of mental disability which goes undiagnosed because of limited knowledge and lack of adequate skilled personnel to assess. There is scarcity of data with respect to mental disability and its associated factors at community level in India. As far as our knowledge is concerned, there is only one community-based study in a rural area using Indian Disability Evaluation and Assessment Scale (IDEAS) for assessment of mental disability. It is also important to assess the burden of mental disability in an urban setting due to rapid urbanization and industrialization. There are some hospital-based studies among mental illness patients to assess mental disability using IDEAS.,, Mental illnesses have invisible disability. IDEAS is for quantifying disability in mental disorder. In these epidemiological studies, it should be applied to those who are having mental disorders such as depression, psychosis, obsessive-compulsive disorder, mood disorders, dementia, and traditionally substance abuse; while mental retardation-related disability is not quantified with this. Four domains or items of IDEAS are not specific to any mental disorder; they can be varying to different extent in the population and duration of mental illness score is only known in those who are diagnosed with the mental illness. However, it is also important to identify mental disability even among those with previously undiagnosed mental illness population. Identifying even mild and undiagnosed mental disability will help in developing community-based rehabilitation and intervention programs for this target groups at community level. In the above context, the present study was conducted in an urban area of Puducherry, India, with the objective to assess mental disability and to study the sociodemographic and associated comorbid chronic conditions of the mentally disabled in a general population. The study was approved by the Institute Scientific and Ethics Committee. Informed written consent was obtained from the study subjects. This community-based cross-sectional study was conducted in urban field practice area attached to a Tertiary Care Medical Institute, Jawaharlal Institute of Postgraduate Medical Education and Research ( JIPMER) in Puducherry for a period between April 2013 and March 2014. The total population in the urban field practice area of JIPMER is estimated to be 9400. The areas include four wards, namely, Kuruchikuppam, Vaithikuppam, Vazhaikulam, and Chinnayapuram. The sample size was estimated based on infinite population. By considering the prevalence rate of mental disability as 2.3%, and a relative precision at 25% level, sample size would become 2616. After adding nonresponse rate of about 3%, total sample size became 2697. Out of the four ward areas, 3 ward areas, namely, Kuruchikuppam, Vaithikuppam, and Vazhakulam were selected purposively considering the homogeneity of sociodemographic characteristics in these areas. Apprehending some of the unavoidable feasibility problems, these three wards were selected without any selection procedure. Chinnayapuram ward area also includes fishermen community, who are frequent movers for their occupation aspects and we anticipated their nonavailability during data collection. Otherwise, all the four areas are comparable with respect to cultural and other sociodemographic characteristics. Hence, because of selection bias, there may be difference in mental disability prevalence estimate in this population. At the first step, sample size for each ward was estimated based on proportional sampling, in which number of study subjects belonged to ≥5 years age group selected from each ward is proportional to the respective population size of ward [Table 1]. Then, to meet the required sample size from each ward area, every 2rd household was selected. All the subjects of the selected household belonged to ≥5 years age group were included as the study sample. All persons who are biologically related with the other members and eating from a common kitchen were considered as members of the family and were eligible for the study. If a designated person could not be contacted during two separate visits after the initial visit, then also, subject is considered as nonrespondent. Mental disability was assessed using IDEAS – A scale for measuring and quantifying disability in mental disorders developed by the Rehabilitation Committee of Indian Psychiatric Society in December 2000. IDEAS was field tested and has been gazetted by the Ministry of Social Justice and Empowerment, Government of India., This questionnaire was translated into Tamil language and again back-translated into English by independent experts. This Tamil translated version of the questionnaire was used by the medico-social worker in the community. Medico-social worker was recruited and trained in administering the questionnaire. Written informed consent was obtained before administering the questionnaire. She collected the data in the house of the subjects by making house to house visits and interviewed all the individuals aged ≥5 years in the selected family using the pretested questionnaire. In addition to previously diagnosed mental illnesses, depression, and generalized anxiety disorder was diagnosed based on the International Classification of Diseases-10 criteria. In case of psychotic disorders, primary caregiver was interviewed and in case of nonpsychiatric disorders, study participant was interviewed for the assessment of mental disability. For persons with mental illness from age 7 to attainment of majority, assent was obtained. Work: Three areas covered are employment/household work/school work-related functioning. 0 – No disability, 1 – mild disability, 2 – moderate disability, 3 – severe disability, and -4 profound disability. Less than 2 years – score to be added is 1; 2–5 years – add 2; 6–10 years – add 3; >10 years – add 4. Final global disability score is calculated by adding total disability score and weightage score related to DOI. It is interpreted based on score as following percentage of disability due to mental illness. Score 0 – no disability (0%); score 1–6 – mild disability (<40%); score 7–13 – moderate disability (40%–70%); score 14–19 – severe disability (71%–99%), score 20 – profound disability. All the preexisting chronic medical conditions such as diabetes, hypertension, bronchial asthma, chronic obstructive pulmonary disease, cardiac disorders, joint pain, and backache were taken into consideration for studying the comorbid chronic conditions associated with disability. “Current smoker” was defined as having smoked at least once in the last 30 days preceding the survey. Consumption of at least 30 ml of 40%–50% alcohol for at least three times in the preceding week of the survey was considered “current alcohol use.” The presence of conflicts was assessed based on subjective response regarding any interpersonal conflicts presently within family members or outside. The data collected was entered and analyzed using IBM PASW Statistics-19.0(SPSS Version-19.0), India, Country Office Bangalore. Chi-square test was carried out to test the differences between proportions. To find out the independent association between mental disability and its associated factors, multiple logistic regression analysis was carried out and adjusted odds ratio (AOR) was calculated. P < 0.05 was considered statistically significant finding. About 2537 subjects were covered with a response rate of 94.1%. 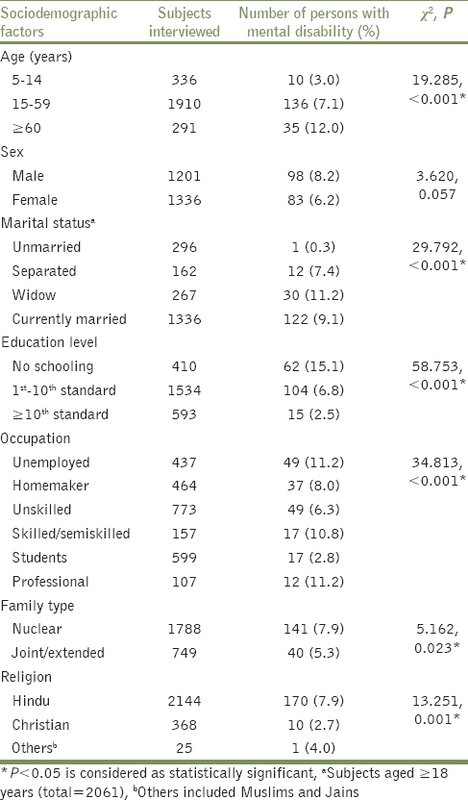 The respondents and nonrespondents are comparable with respect to their sociodemographic characteristics [Table 2]. About 88.1% of nonrespondents belonged to 15–59 year age group compared to 75.3% in response group. The main reason for nonresponse is their nonavailability in their house even after 2 visits after the first visit (90%). The overall prevalence of mental disability was found to be 7.1% (181/2537). Among them, majority had mild mental disability (151, 83.4%), followed by moderate (21, 11.6%), severe (8, 4.4%), and profound (1, 0.6%) mental disability. The persons with mental disability who were previously diagnosed with mental ailments (57/181) include bipolar affective disorders (13), mental retardation (3), fits (1), neurosis (4), schizophrenia (2), and alcohol addiction (38). All the other persons with mental disability (124/181) had depression (89) and/or generalized anxiety disorder (38) who were previously undiagnosed for any mental illness. All of them belonged to mild mental disability category. Majority of the study subjects belong to age group of 15–59 years (75.3%). Males were comparatively lesser than females (47.3%). About 60.5% of the study subjects were educated between 1st and 10th standard. Nearly, one-third of the subjects (30.5%) were unskilled workers followed by students (23.6%). 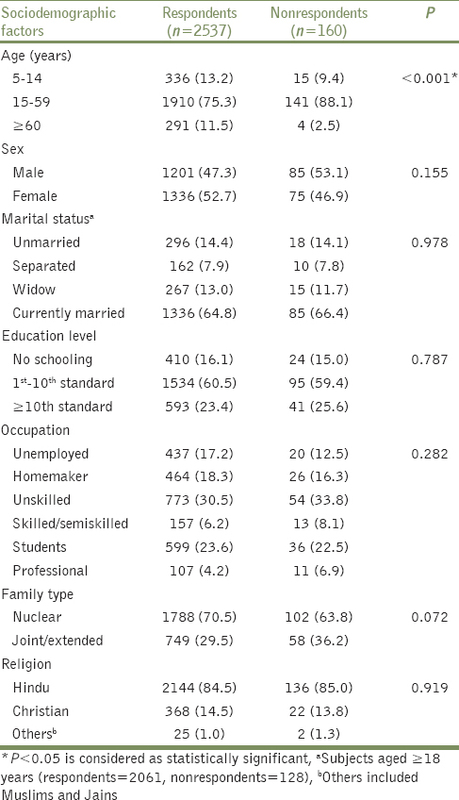 Univariate analysis showed that sociodemographic factors which include age group status, marital status, education level, occupation, family type, and religion were found to be associated with mental disability [Table 3]. 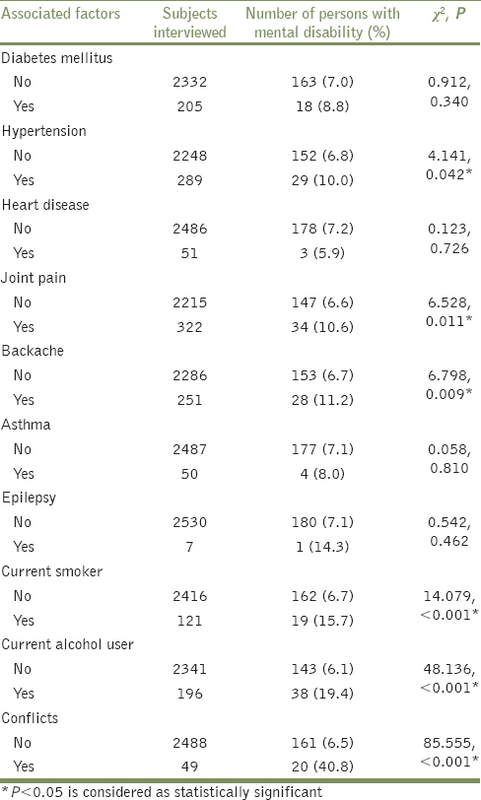 Among the chronic comorbid conditions and personal habits, variables which include hypertension, joint pain, backache, current smoking, current alcohol use, and family conflicts were associated with mental disability [P < 0.05, [Table 4]. Multiple logistic regression analysis showed that male (AOR = 2.064), widowed (AOR = 27.022), separated/divorced (AOR = 16.674), currently married (AOR = 18.487), illiterate (AOR = 4.352), 1st–10th standard education (AOR = 2.531), unskilled (AOR = 0.287), semiskilled/skilled occupation (AOR = 0.025), nuclear family (AOR = 1.816), and absence of conflicts (AOR = 0.259) were significantly associated with mental disability compared to their counterparts [Table 5]. Epidemiological studies on mental disability using IDEAS at community level are very less in India. Our study highlighted the fact that the prevalence of mental disability is more than 3 times compared to the 2.3% prevalence reported in Karnataka. However, the proportion of mild mental disability in the above study was 45.5% (10/22) compared to 83.4% (151/181) of persons with mental disability in this study. This difference in estimated and actual prevalence may be due to the fact that the above study assessed the mental disability among those with previously diagnosed mental illness in contrast to this study where mental disability was assessed for those with previously diagnosed and some undiagnosed mental illness. The selection bias also may be responsible for this difference. The higher prevalence in this study also may be due to influence of factors such as lesser education level, presence of conflicts, rural-urban difference, and increased alcohol use among persons with mental disability. The prevalence was also found to be significantly more among males in contrast to the above study. A study in a hospital in India using IDEAS reported that the presence of mental disorders was associated with significant disability and among these, schizophrenia being maximally disabling. Thus, the cases which were coming to hospitals might present with severe symptoms, and therefore, the disability severity of persons with mental illness in hospital setting may be comparatively more than community-based studies. However, there are reports available for burden of mental disorders at global level. A recent meta-analysis data found that at global level about 17.6% had common mental disorder in the preceding 12 month period of the assessment. This is far higher than the data available in India., There is a wide variation in the prevalence rate of mental disorders within the country and international level due to difference in study design, operational definitions used for the survey, data collection methods, and variables used. The prevalence of mental disability in this study among those with no schooling was found to be 15.1% which is higher than the previous study where it was reported as 8.3%. This study also showed that mental disability is comparatively more among those with widowed with 11.2% prevalence. A previous study reported that among widow, prevalence of severe depression was 27.8%, and currently married women it was 5.6%. Similarly, another study reported that being married or cohabiting and higher education levels were associated with reduced odds of severe disability. This study included mainly the mental, neurological, and cardiovascular disabled who were applied for disability certification. However, in this study, the association between marital status and mental disability should be interpreted with caution since there is only one person with mental disability in unmarried group and comparisons of other marital groups are made with respect to this category as reference in multiple logistic regression analysis. In view of the above, larger cross-sectional studies with more samples in this subgroup may give more valid information in this regard. Mental disability was found to be comparatively lesser in unskilled/semiskilled/skilled occupation and those without conflicts groups. A recent study highlighted the fact that there is a strongly significant effect of mental illness on employment and clear evidence of reduced occupational skill level. An Indian study in an urban slum area in Kolkata reported that there was a significant association of mental health problems with low educational status, unemployment, and large family size. Hence, vocational training of mentally disabled is also an important aspect to be considered to improve the quality of mental well-being of this group. This study showed that the prevalence of mental disability is 40.8% among those with conflicts compared to 6.5% among without conflict group. The previous studies also have shown that marital, interpersonal, and family conflicts were associated with mental disorder., Conflict management through counseling of persons with mental disability may help to reduce the severity of disability and improve their mental well-being in the community. The major core attributes of disability related to alcohol abuse are changes of emotional state, social relationships, memory, and thinking. The most important supplementary attributes are anxiety, impairments of speech, and hearing., It was also shown that alcohol abuse was associated with mental disorders such as depression, anxiety disorders, and suicide risk. As in this study, the prevalence is more among those with alcohol use; there is a need to strengthen services through alcohol deaddiction centers to this vulnerable group. It is important to identify the mild and moderate degrees of mental disability because they go unnoticed by the healthcare delivery system. Besides they are amenable to preventive and rehabilitative measures so that progression to severe disability can be slowed. Therefore, this study gives an insight into the burden of unrecognized mild categories of mental disability similar to ice berg phenomenon of disease. In addition, the proportion of moderate and severe categories will help in determining the amount of resources required in the health care system. There are some concerns with respect to internal validity of the study. The sample size was estimated using 25% relative precision which may be higher than expected and the study did not consider the design effect. However, required sample size based on prevalence of 7.1% with 20% relative precision comes about 1257. If we inflate the sample size with design effect of 2, the required sample size for getting a precise estimate for the prevalence of mental disability will be 2514 which was covered in the study. The study findings should be interpreted with caution while generalizing it to the general population due to following reasons. Since we have not included one ward area, the persons with mental disability may not be representative of population although most of the cultural and sociodemographic characteristics are comparable in all four ward areas. Because of selection bias, there may be difference in estimated prevalence and actual prevalence of mental disability. We could not diagnose the depression and generalized anxiety disorders by psychiatrist which may also affect the prevalence. We also could not assess other previously undiagnosed mental disorders due to feasibility constraints. In other parts of the country, difference in exposure of sociodemographic, cultural factors, and rural-urban difference may also influence the difference in the prevalence of mental disability. We could not assess some associated factors of mental disability. In spite of these limitations, the study gives valuable information on magnitude of mental disability in an urban community which will help in taking appropriate prevention and health promotional measures to this group. There is a need to prioritize strategies at regional level based on the burden of exposure of risk factors associated with mental disability such as family conflicts, alcohol use, increasing marital divorce, or separation rates. Males, lesser education level, skilled or unskilled occupation, nuclear family, and conflicts were associated with mental disability after adjusting for other variables. Multicentric cross-sectional analytical studies will explore the mental disability burden and its associated factors at regional or country level. Future directions of research also should emphasize follow-up studies on mental disability in different types of mental disorders and its relation to sociodemographic characteristics, comorbidity status, conflicts, substance abuse, and quality of life. This study was a funded intramural project. We thank the Medico Social Worker staff who were recruited by Mrs. Nithya for the project. Authors also thank Urban Health Center staff and the subjects who participated in the study. World Health Organization. Training in the Community for People with Disabilities. Geneva: WHO; 1989. Census Data 2011. Data on Disability. Office of the Registrar General and Census Commissioner, India; 2013. Available from: http://www.disabilityaffairs.gov.in/upload/uploadfiles/files/disabilityinindia2011data.pdf. [Last cited on 2016 Jun 23]. Mohan I, Tandon R, Kalra H, Trivedi JK. Disability assessment in mental illnesses using Indian Disability Evaluation Assessment Scale (IDEAS). Indian J Med Res 2005;121:759-63. Roopesh Gopal N, Sudarshan C, Kumar SG. Relationship of quality of life with disability grade in obsessive compulsive disorder and dysthymic disorder. Indian J Palliat Care 2014;20:212-4. Guidelines for Evaluation and Assessment of Mental Illness and Procedure for Certification: Ministry of Social Justice and Empowerment, Government of India; 2002. Available from: http://www.ccdisabilities.nic.in/page.php?s=&t=pb&P=guide_mental. [Last Cited 2016 Jun 28]. Steel Z, Marnane C, Iranpour C, Chey T, Jackson JW, Patel V, et al. The global prevalence of common mental disorders: A systematic review and meta-analysis 1980-2013. Int J Epidemiol 2014;43:476-93. Raggi A, Covelli V, Pagani M, Meucci P, Martinuzzi A, Buffoni M, et al. Sociodemographic features and diagnoses as predictors of severe disability in a sample of adults applying for disability certification. Int J Rehabil Res 2014;37:180-6. Cornwell K, Forbes C, Inder B, Meadows G. Mental illness and its effects on labour market outcomes. J Ment Health Policy Econ 2009;12:107-18. Silvanus V, Subramanian P. Epidemiological study of mental morbidity in an urban slum community in India for the development of a community mental health programme. Nepal Med Coll J 2012;14:13-7. Panigrahi A, Panigrahi M, Padhy AP, Das SC. Common mental disorder and its socio-demographic correlates among married women residing in slum areas of Bhubaneswar, India. Women Health 2016;1-13. Nadkarni A, Weiss HA, Naik A, Bhat B, Patel V. The six-year outcome of alcohol use disorders in men: A population based study from India. Drug Alcohol Depend 2016;162:107-15. Kumar SG, Das A. Are the disability data in India appropriate? Natl Med J India 2009;22:278.